Are you a brand-new subscriber? Welcome! Everyone else, you know I appreciate your continued support, trust, and friendship. It's been a busy week here in central New Hampshire. A week ago today I awoke to my worst nightmare. The entire driveway was covered with 1 or 2 inches of ice. The day before the third storm in six weeks deposited slushy concrete out of the sky. That's what I call it. Snow so wet it's impossible to move with a snowblower. Snow so heavy it's virtually impossible to shovel it. The temperature plummeted overnight and it all froze. You have to come down a hill to my house and one 30-foot-length of the driveway is a 25-percent grade. That means the driveway goes up 25 feet in elevation for every 100 feet of horizontal travel. In other words, this section is very steep. I wasn't home when the last storm struck. Kathy did her best to clear two paths on the steep section so I didn't slide down into the lake upon my race back from Bar Harbor, Maine. Suffice it to say that after 400 pounds of salt, the past three days with temperatures hovering around 32 F, and me out there with special shovels I was able to clear the driveway of all ice. However, the flat section down near the house is a giant glacier. I'll see the blacktop again in April! I received a cool gift this past Christmas. 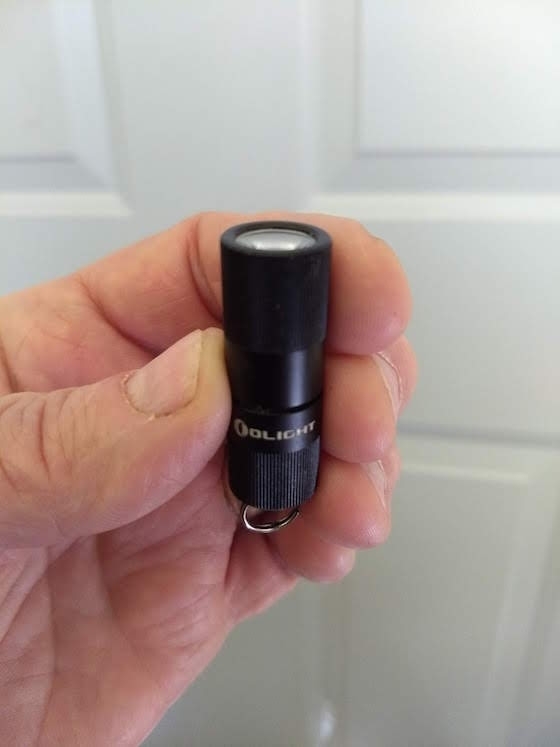 The Olight I1R EOS. CLICK HERE to read my review and see more photos. I GUARANTEE you'll be buying one of these bad boys for your keychain. This tiny little light saved my bacon in the dark crawlspace up in Bar Harbor ten days ago. The weather has been brutal up in Bar Harbor, Maine and my daughter and son-in-law's house is struggling to get a roof on it. Finally the trusses started to go up two days ago. 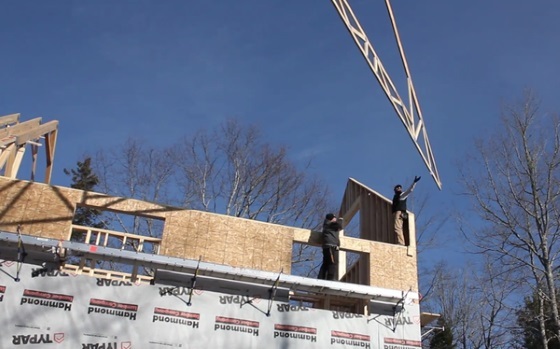 CLICK HERE to watch a short video of that truss being guided into place at the south end of the house. See the BIG HOLE in the truss? Do you know what that is? It's the outline of a giant open attic space that will be in the house. Once all the trusses are set, there will be a room 43 feet long, 18 feet wide and 8 feet tall! Look again at the truss in the photo or video. Do you see how it has a built-in floor truss below the hole to support all the weight of a normal floor? Yes, you can have ROOMS up in attics that are built with trusses! You can have spaces in low-slope roofs for storage if there's not enough room to stand. CLICK HERE to discover more about Attic Trusses and the closest lumberyard near you that can design exactly what you want. 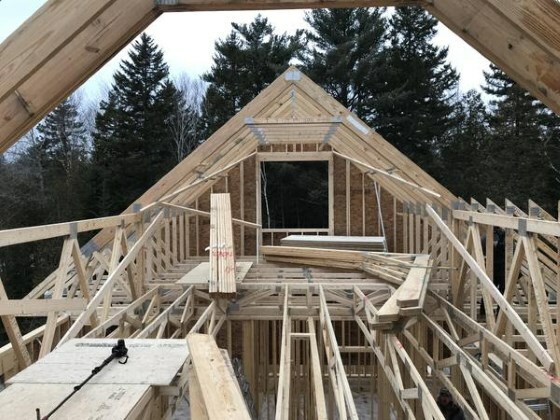 Look at the following photo of the roof structure and note how the floor trusses switch direction so a FULL-SIZED STAIRCASE can get up into the attic, not one of those flimsy pull-down staircases you see in most homes! CLICK HERE to discover how to get a full-sized staircase up into the attic of your home or your next room addition. CLICK HERE to get a handle on all things attic trusses. I think you'll not be disappointed in this past column I wrote. The BONUS of CLICKING here is you get to see a photo of the desk I work at each day. Go ahead, do it. Wait until you see what's pinned to the ceiling/walls in my office. Quite a few public relations people have my email address. It's their job to reach out to me on behalf of their clients. Each winter I get hammered with offers to speak with experts about how to save money on fuel bills. Some of the advice they're purveying is not the best. Yet, I see many of my peers publish the press releases and you may fall prey to the advice. 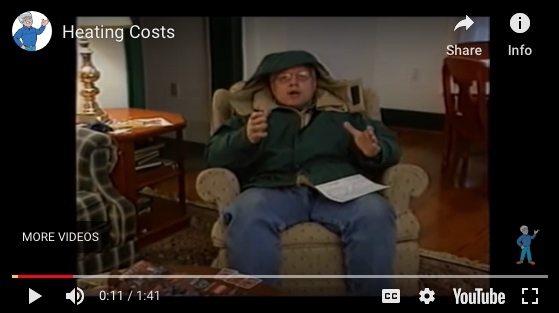 CLICK HERE to watch one of my SHORT VIDEOS to see my advice on how to lower your heating bills. That's quite enough for today. There's a MONSTER snowstorm forecast for my area this Saturday and Sunday. I'll be digging out all day Sunday and should be able to relax to watch the NE Patriots game out in frigid Kansas City. If you can't say something NICE about someone/something, don't say anything.